A unique opportunity to experience the City’s rich tapestry of culture, arts, food wine and people. 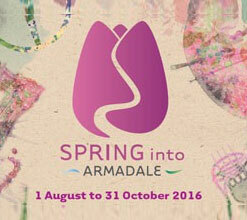 Check out the jam packed calendar of events at www.visitarmadale.com.au/spring-armadale or call into the Visitor Centre and pick up your copy of the program. Featuring over 120,000 tulips highlighted by thousands of other flowers throughout the Park. Join us this Spring for an enchanting journey of colour in Perth's Hills from Saturday 20 August to Sunday 18 September 2016. 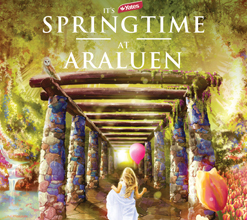 The City of Armadale Fashion Show will be held in Armadale’s picturesque Darling Scarp hills setting at Araluen Golf Resort on Saturday October 29. In a fashion first, the City of Armadale is honoured to host the unveiling of a new collection from West Australian designer Red Opium. The pattern on the silk fabric is designed by internationally renowned WA Noongar artist Peter Farmer. Fashion choreographer Catherine Birch will reveal the Red Opium collection, for the first time in Australia, at the Spring into Armadale Fashion Show before it tours the world’s fashion stage. Sponsored by the Malaysian Government, the collection will be showcased at the launch by models from Fashion Advocate’s Life Skills Program before it is taken internationally to Malaysia Fashion Week. Tickets are on sale now from the Visitor Centre or, for more information and direct ticket sales visit www.visitarmadale.com.au/events/spring-armadale-fashion-show. Millbrook Winery’s annual Spring Lunch celebrates so many things. 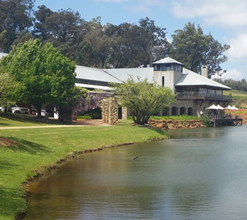 Start the day with a winery tour and enjoy canapes and a glass before moving through to the dining room to experience a carefully matched long lunch while overlooking the sparkling lakes and rolling vistas of Millbrook. Gather your family and friends for this special event on Saturday October 1. For more information, visit www.millbrookwinery.com.au or call 9525 5648 for bookings. It’s kilts and bagpipes as far as the eye can see in the largest Highland Gathering in Western Australia. 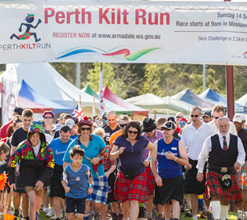 Kicking off in the morning with the much loved Perth Kilt Run, the day explodes with fun and kilt colours as hundreds of participants scramble to the finish line. Let your imagination run wild in the medieval fair of the clan village and kick up your heels with live music from some of Perth’s best folk bands. It all happens at Minnawarra Park, Armadale, Sunday September 18. Further details and registrations can be found at www.perthkiltrun.com.au.